BILD 800 Wine Room Black (P/N 7343). With stained hardwood racking for 800 bottles, BILD wine rooms are perfect blends of function and value. These wine cabinets feature durable, durable melamine laminates on all exterior surfaces, thermal and UV protection, and advanced wine cellar refrigeration by CellarPro Cooling Systems. All panels are framed and insulated with high-density foam, and wood wine racks are efficiently sized to accommodate oversized bottles. BILD 800 racking is located on the left and right walls for easy access, with storage capacity for 320 bottles in 3-3/4 inch individual slots on each wall. In addition, 13 cubic feet of bulk storage space exists atop the racks, perfect for up to 156 Bordeaux-size bottles, or for oversized bottles like Magnums and large Champagne bottles. Placement requirements: The cooling unit, mounted on the left or right side of the wine room, requires ample clearance behind and above the unit for proper air circulation. The location must be sufficiently large for the hot air generated by the cooling unit to dissipate. 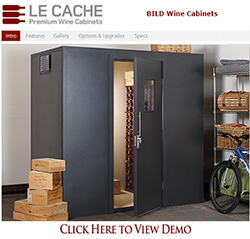 BILD wine rooms should not be placed in environments that exceed 95F or fall below 50F. Door must be locked to ensure an airtight seal. Because of the significant weight of your wine cabinet, it is important that it be placed on a hard surface, otherwise the cabinet may become skewed if the doors settle unevenly over time. If you will be placing your cabinet on thick carpeting, consider placing a carpet board underneath the wine cabinet. The cooling unit generates hot air that must be exhausted in such a way that it won't be recirculated by the cooling unit. If the hot air cannot be dissipated or channeled properly, and the cooling unit is forced to recycle its own hot air, the cooling unit will be unable to maintain cold temperatures inside the wine cabinet and/or it will run all the time. 320 bottles in 3-3/4 inch individual slots on each wall. 13 cubic feet of bulk storage space atop the racks, perfect for up to 156 stacked Bordeaux-size bottles, or for oversized bottles like Magnums and large Champagne bottles. Additional storage for stacked cases is available on the floor, and is not included in the figures above. The Thing is a Monster! Just thought I would give you a brief update. The thing is a monster...my neighbors were thinking I had a new cardboard car in my garage. Well, the delivery was painless. The drivers maneuvered the beast into the garage with little effort. After unwrapping and pulling the packing (which was very well done as I found no issues with the pieces due to shipping). My wife and I were able to get a few of the pieces to the basement where the unit is installed. I enlisted the help of my neighbor for the four big pieces which were, surprisingly, not too heavy. With all the pieces in the basement, I proceeded to start the assembly. getting the walls up was not too difficult (getting all the nuts screwed done was a bit of a challenge due to the tight space, a Sears ratchet wrench may have been useful). With the walls up, my neighbor and I lifted the roof into place with my son and wife bracing the walls. Once in place, we bolted it together and moved to the back wall. This was what I expected to be a real challenge...fit twenty or so pegs into holes all at once. Again to my surprise, it slid in fairly easily (with a little persuasion from the rubber mallet). Got that and the front bolted down, door installed and called it a day. Next, I installed the cooling unit and started on the wine racking. The racking went together with no issues (another surprise in a growing list). Put the racking in the room and turned on the cooling. Seems to be running pretty well so far. Total time invested in install is probably 12 - 14 hours. Just a comment on the construction of this wine room...it is great. The assembly was great (considering the size of this thing, it was easy!). The quality of the materials is very good, the walls are sturdy as are the racks. All told this is a great unit (from a build perspective). Only complaint I can even try to bring up is that the caps for the bolt holes on the inside of the unit are dark brown while the interior is a lighter color...makes them stand out more than they should (sorry had to come up with something). Now, the task is to move the wine into the room, a task for the weekend. I will follow-up with some comments on the performance and a few pictures of the room when I can.